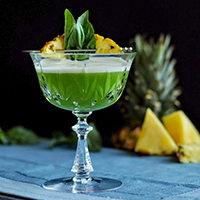 Pineapple and Basil, for garnish (optional). Boxcutters, Jigger, Muddler, Shaker Classic/Boston, Citrus Juicer, Strainer, Martini Glass. In a cocktail Shaker, Muddle Basil Leaves and Sugar very well. Add Cachaca, Pineapple Juice, Lime Juice, Chartreuse and Egg White and dry Shake (without ice) until well combined. Add a handful of Ice and shake like you mean it for a solid minute or so. Strain into a chilled Martini Glass and top with Celery Bitters. Garnish as desired.